A couple days ago meemsnyc asked if I had any pictures of my garden. Reluctantly, I am posting one today. Please keep in mind that it is towards the end of August so the garden is starting to show it's fall nastiness. Second, right before I took this picture, we were hammered by 3 very nasty thunderstorms. If you watch the news, I'm sure you have seen pictures or heard stories of the massive flooding in Iowa, well there you go. Anyway, being that it is this time of year, I haven't spent to much time making my garden look all that pretty. 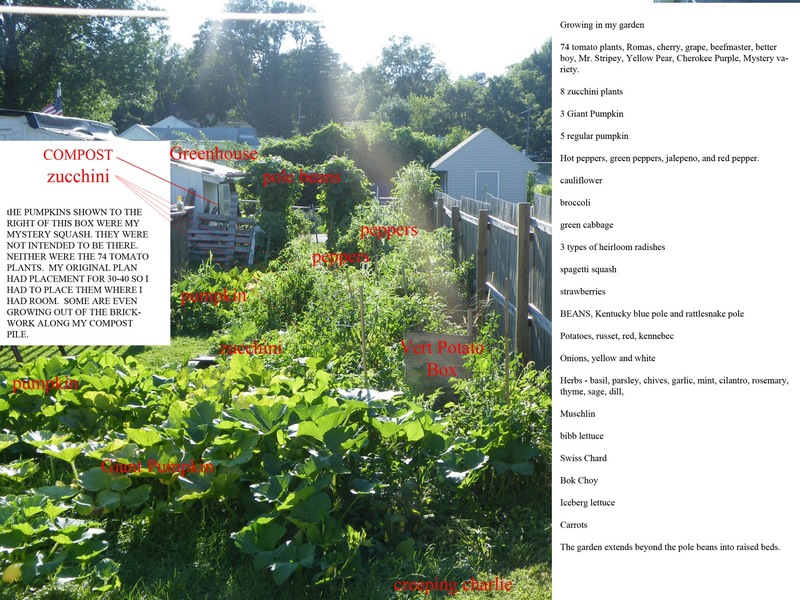 Oh and one more thing to keep in mind is that I thought I had the PERFECT layout for my garden this year. A responsible, wonderfully planned, garden. However, my garden had other plans. It gave me about 30-40 volunteer tomatoes, all of which I kept (and they are producing well) and volunteer mystery squash that turned out to be pumpkins. My plans went down the drain as I strategically found places for all of my volunteers. Some are even coming up in the brick work around my compost pile. Those I just left. Anyway, if you would like to see a close up of my nasty, beginning of fall, hammered by thunderstorm garden, here it is. For a larger view, please click on the picture. So there you have it. My overgrown garden. I thought about drawing you layout of what it should have been but I'm sorry but I don't have time. Just imagine if you will what it would look like without 30 tomato plants and without the majority of the pumpkins. Pretty huh. There is always next year. Bummer :). I don't think that looks messy at all. It looks much nicer than mine, where most of the plants on on their way out. Thanks for sharing. I don't think it looks bad at all! 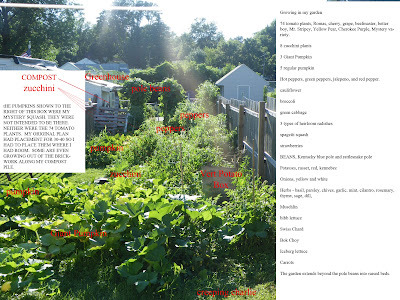 It's always interesting to see what all a garden grows, and how everything is laid out. 30-40 volunteer tomatoes, and you kept them all? Wow. Were all the volunteers from your compost? I'm curious about how you ended up with so many volunteer tomatoes. @Rachel, I didn't take a close up for a reason :). It looks all nice an green from far away. But thank you. Sometimes I think we are our own worst critic. @thyme2garden thank you as well. the 30-40 are the ones that I kept, I did accidently tear some out while weeding. I did keep them all and some of them are a result of the tomato eating cat taking bites out of the tomatoes and letting them drop. By the time I would get to them they would be a nasty mess and I would leave them on the ground. Some may be from the same compost I had my mystery squash in. They tend to pop up in groups of 5 or so and I would seperate them. I have a weakness when it comes to killing of volunteers. I might need therapy lol. All of the volunteers seem to being just as well as the others, thank goodness. Thank you so much for posting a photo of your garden! I love it! It's so lush with plants!! Wow, 30-40 tomato volunteers! Lucky you! I hope we get some volunteers in our garden next year. Your cat is a good "secret" gardener, leaving seeds everywhere! We had a few volunteer petunia plants, we poured seeds in the front garden and the birds eat and tracked the seeds everywhere. So I have them growing in the vegetable garden which was weird but pretty!